We’ve provided leading-edge framing and art preservation services for more 20 years. Click on the image above to learn more about us. Charly leads Artscapes’ newest outpost in Cotati, CA. Click above to learn about her 10+ years’ experience with vintage posters and antiques. 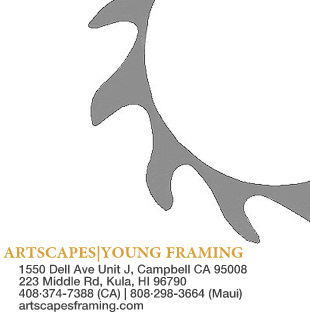 Come to us for the highest quality framing and design, friendly service, and the best guarantees. Click above for details. Artscapes sells paintings and prints by former staff member Randy Hinz. Click above to view his stunningly detailed work. Click above to view examples of our work. Preservation framing of rare and antique posters has long been an Artscapes specialty. Click above to learn more. Our ‘A-to-Z’ service can take care of every step of your framing or art preservation project. Click above to see what’s possible. Our clients have included Google, Apple, eBay, and AMD, among others. We handle every type of project, large or small. Click above for more information. We have locations in Campbell/San Jose, Cotati, CA, and Maui. Click above to contact us.